So the key to the dairy free version is nutritional yeast and ghee. Nutritional yeast is a deactivated yeast that is an important source of B vitamins for vegans and vegetarians (B vitamins come from animal sources. Yeast being a eukaryote [made at least of a single cell] makes B vitamins). It has a nutty flavor. Ghee is clarified butter – butter in which the milk solids have been removed – so it is dairy free, but not vegan. I love the idea of using nettle, given we often think of it as a weed, but I don’t see it too often on the west coast. 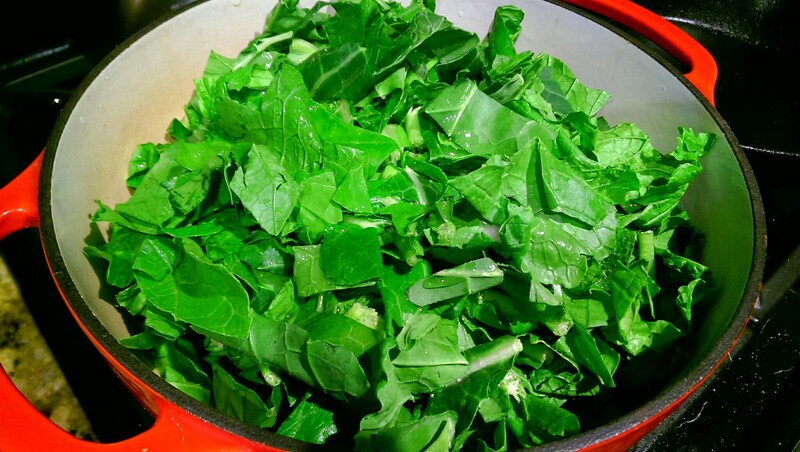 Instead, I used a variety of leafy greens grown in the garden – several varieties of chard, collard, mustard greens and I even threw in radish and carrot tops, but you can easily buy a bag of pre-chopped greens – like the chard, turnip, collard and mustard green mix from trader joes. Do what is easiest for you. Roughly de-stem and chop it – it will be processed in a food processor so no need to take great care in the early steps. After wilting it in a pot, add baby spinach and continue to wilt. Remove the greens saving the liquid in the pot. Place the greens in a food processor, along with some garlic, pulse until thoroughly chopped making sure any stems are broken down. The ravioli hold up best when the water is removed from the greens, so strain the greens in a cheese cloth making sure to save the water and add it to the saved cooking liquid. You should end up with about 1 – 1.5 cups of cooked greens. Place into a bowl and add butter or ghee for added fat and richness (fat is important) and add either ricotta or dairy-free cashew nut “ricotta”.The dairyless nut ricotta was made by blending soaked cashews with a few ingredients until creamy. The longest part of making the nut cheese is soaking the cashews. You also need parm or a cashew nut parm (simplest recipe ever and so very tasty!!). I love that when I serve both, people love the dairy-free version just as much if not more so. 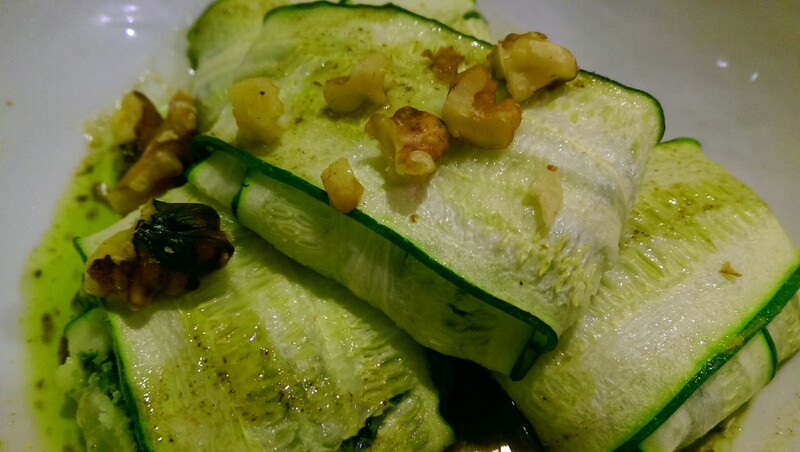 Once you have the filling, it is time to fill the zucchini. 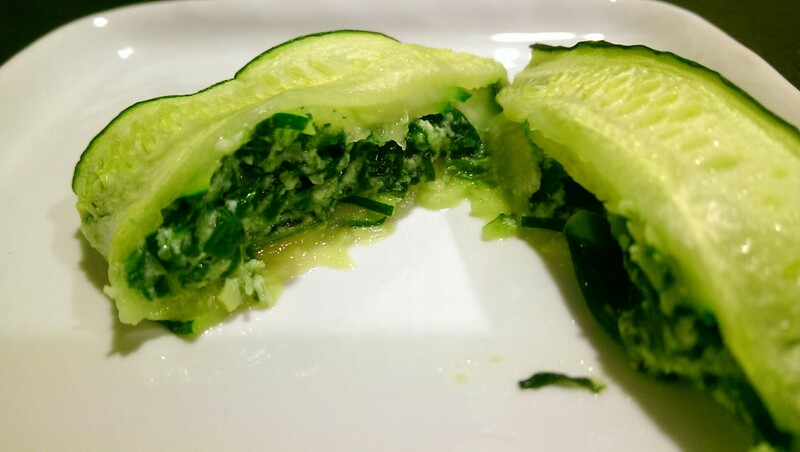 I slice zucchini with a mandolin. 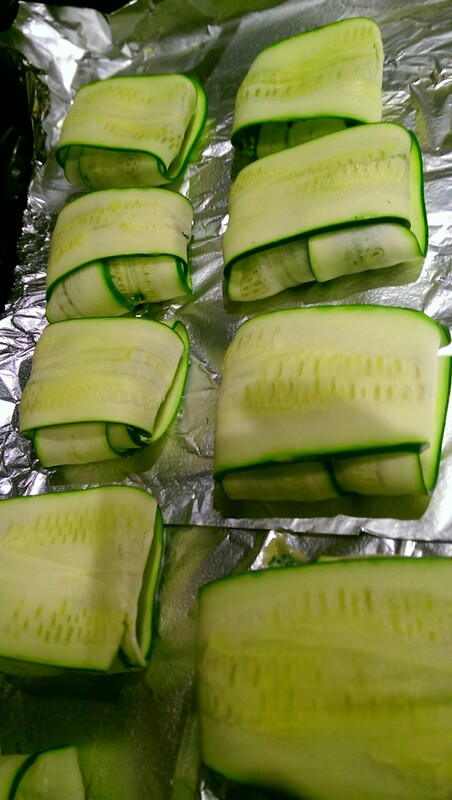 Once the zucchinni is thinly sliced, it is all about folding and tucking.To learn more about slicing, filling, and folding check out one of my previous dairy-free zucchini ravioli recipes. 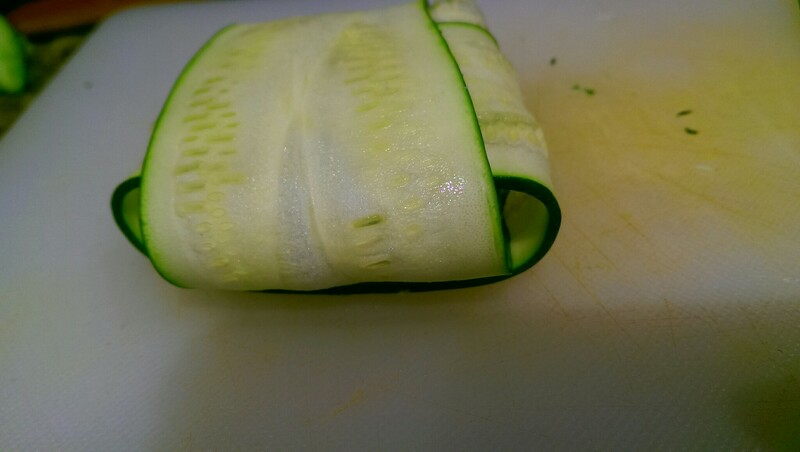 If you squeezed enough water out and evenly sliced the zucchini, you will find that the ravioli impasta (get it?) holds up well. But if you did not generate enough liquid or threw it out accidentally, then use veggie stock (I promise there is a recipe for veggie stock in this link). The sauce is a play on browned butter in the vegan version just using ghee (which is clarified butter and does not have any milk solids). Browning butter causes the milk solids to turn brown and enhances flavor, but we are using veggie stock and sage for flavor. 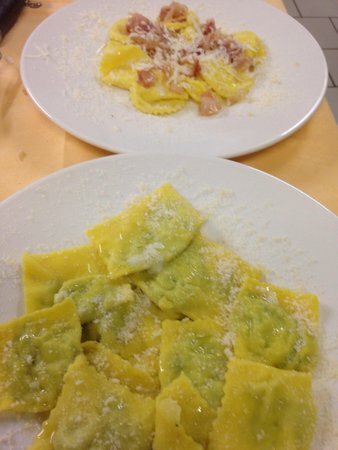 Once all the components are made, place the ravioli in plate or bowl, drizzle with “butter” sauce, garnish with chopped walnuts and dairy-free or dairy parm, serve and enjoy! 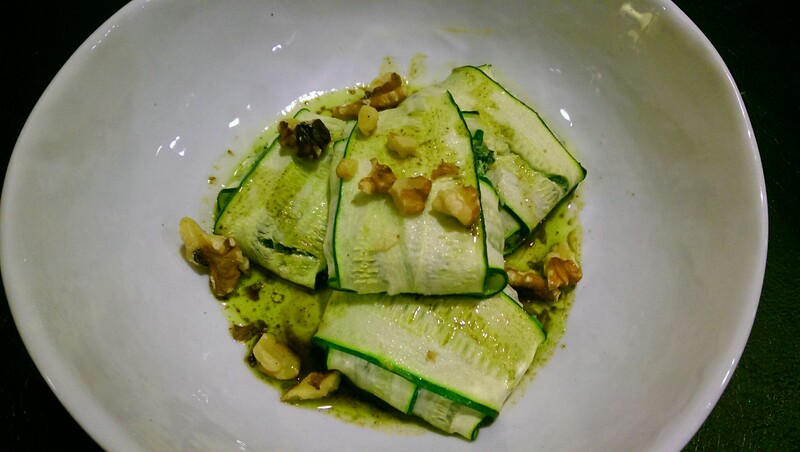 The walnuts give a contrasting texture as the zucchini does not have the resistance and texture al dente pasta would. 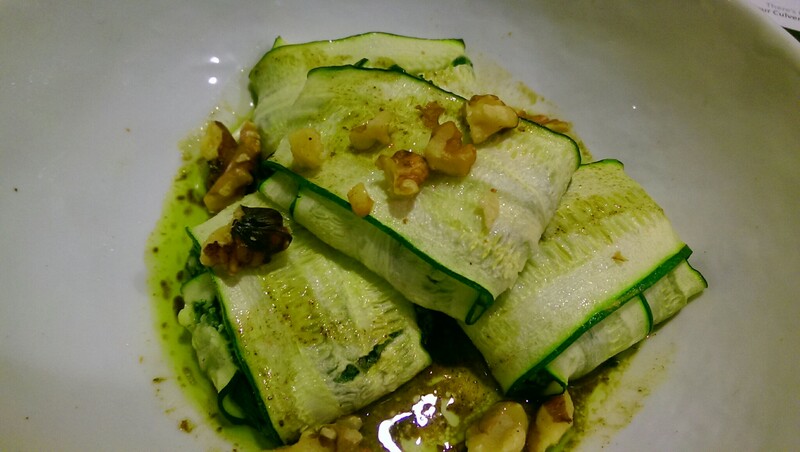 I’d say this is greener, healthier and just as tasty as the version this was inspired from at Via Carota. Place one tsp of butter or ghee into a large pot, melt and add shallot. Cook until gently browned then add water and leafy greens and salt. mix and cover until wilted (about 15 min depending on the greens). 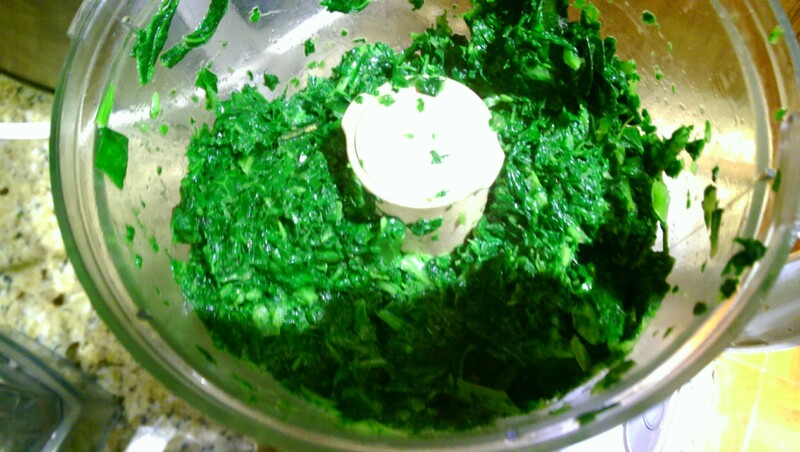 Add spinach and mix, cook uncovered until wilted (about 3 minutes). 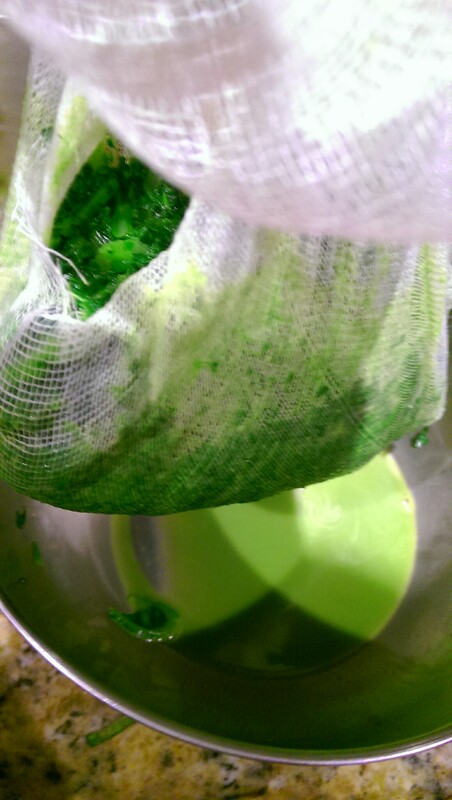 Scoop out and place into a food processor, saving the green water in the pot for later. Pulse greens and garlic in a food processor until thoroughly chopped. 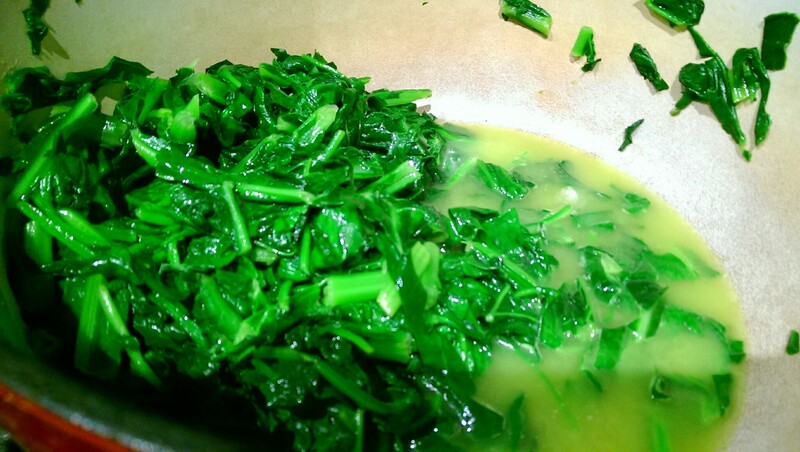 Place chopped greens into a cheese cloth and press out water into the pot containing the green cooking water. Place pressed greens into a bowl, add 1 cup dairy or dairy-free cashew nut ricotta, 1 cup of dairy or dairy-free parmesan, 1Tbs unsalted butter or ghee, nutmeg, lemon juice and mix. Add salt and pepper to taste. 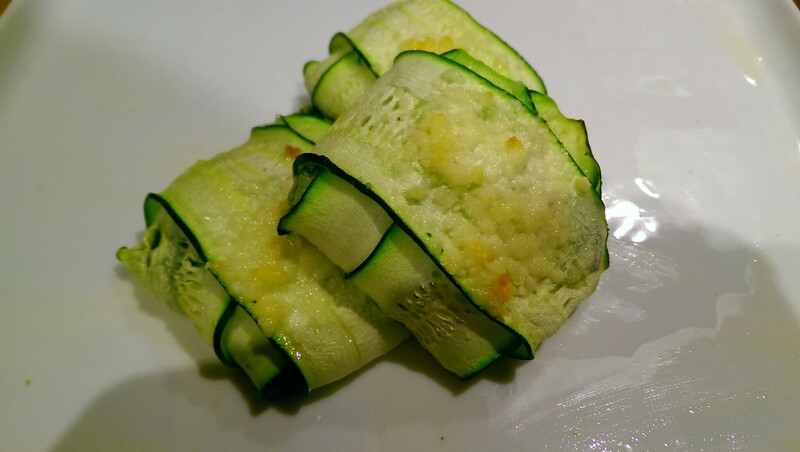 Place two sliced zucchini down so they overlap slightly on one edge. 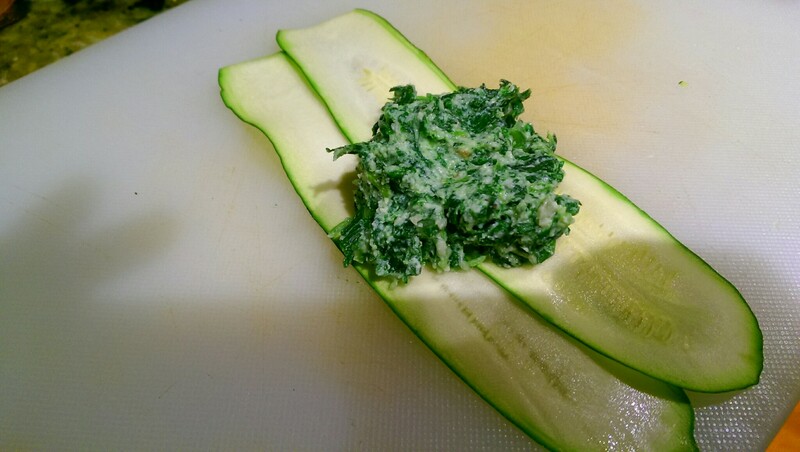 Fill with a small amount of filling (about 1 tsp depending on the size of the zucchini). 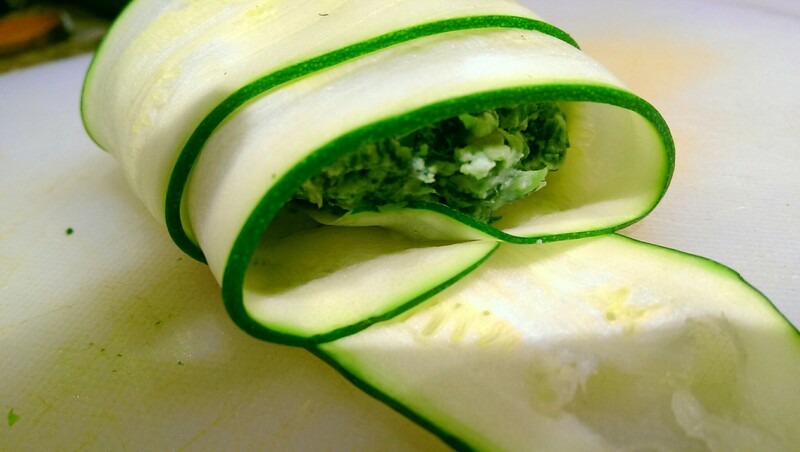 Fold zucchini over, place two more slices on top in the opposite direction and tuck in. Place on oven a greased baking sheet, brush with olive oil and bake for 20 min. Place on a plate, drizzle “butter” sauce over top and garnish with dairy or dairy free parm and crushed walnuts. Place all ingredients (except salt and pepper) into a food processor and blend until creamy, scraping down sides throughout (about 10-20 min to blend). Add a little bit of water as needed to get a creamy texture, but add as little as possible so it does not become runny. Add salt and pepper to taste. Store in an airtight container. Heat ghee in a sauce pan until melted and add liquid and sage. Reduce to a simmer and whisk every so often until reduced and thicker (5-10 min). Add salt and pepper to taste. 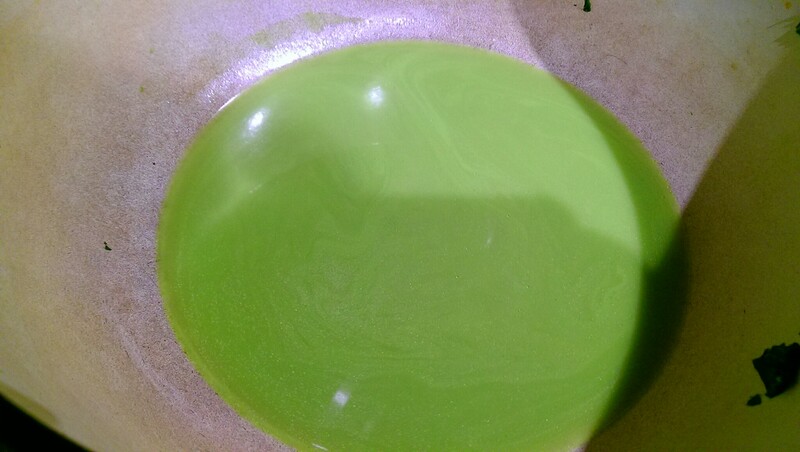 Note, if using greens cooking liquid, the greens will oxidize to a brownish color over time. Also note that the sauce may separate if all the water has not evaporated.